Our Lead Magnet Delivery system makes it easy to deliver a free gift to your leads as soon as they submit one of your forms. You can download three customizable “resource guide” templates if you need a hand creating your lead magnet. Click here to download them. You can edit the templates in PowerPoint (.pptx) or Keynote (.key). When you integrate your page with an email service provider (ESP), Leadpages sends that opt-in information directly to your ESP. After that, the rest of the opt-in process (including confirmation) is managed by the ESP. Leadpages does not receive information back from your ESP regarding whether or not your new subscriber has confirmed their email address. As such, we do not withhold the lead magnet pending confirmation, because confirmation is entirely controlled by your ESP, not by Leadpages. You’ll need to check with your email service provider or marketing platform for instructions on sending files to new subscribers. For full details, see the "Other lead magnet delivery options" section of this article. Otherwise, read on for step-by-step instructions on using our system. NOTE: Each file you upload to our Lead Magnet Delivery system has a maximum size of 250 MB. Click the profile icon in the top-right corner of your account, then Lead Magnets. Click Create New Lead Magnet. Choose a name, upload your file or paste a URL to send your subscribers to, then fill out the sender and message fields. When you’re done, press Save. TIP: You can upload any file type (such as PDF, EPUB, or MP4). And while our system only allows for uploading/sending one file at a time, you can compress multiple files into a singular ZIP file. In order to use your lead magnet, you’ll need to connect it to a form (or pop-up). 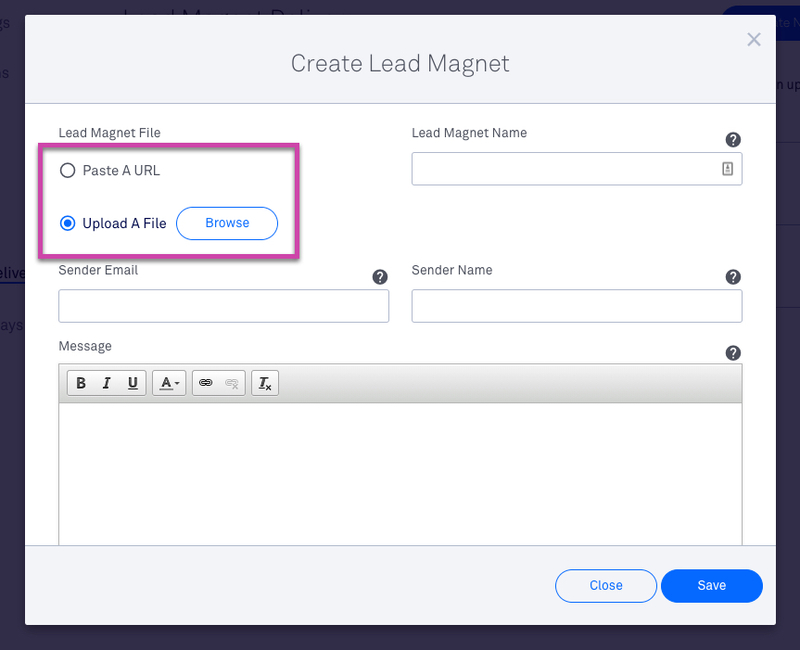 Once you’ve added your lead magnet to your form, anyone who submits it will receive an email with a link to download your file or external URL you chose and the message you wrote when you uploaded it. Add a form widget or pop-up to your page (or use an existing one). Click the form to open its settings, then select the “Actions” tab. Click Add a Lead Magnet and choose your lead magnet from the drop-down menu. Press Save & Close. Then, be sure to update or publish your page. Click any call-to-action button or link on your page to open its associated opt-in form. Select your lead magnet from the drop-down menu. If you’d like, click Customize the email to customize the message that will be sent alongside your lead magnet's download link. Click Save from the popup window if you choose to customize your message. Click Okay in the form settings panel and then save your page. NOTE: The steps above will also work for standalone pop-ups. That’s it! You’ve now added your lead magnet to your form. Our system will immediately send an email to them with a link to your chosen file or external URL (along with your custom message, sender name, and reply-to email address). If you choose a file as your lead magnet, the blue button will read Claim Your Download and if you choose a URL, Claim Your Offer. This button is not customizable. If you've uploaded a file for your lead magnet, when leads click the download button in that email, they can choose between downloading the file or opening it (depending on their browser settings). If you included an external URL instead of a file, when leads click the button in that email, they will be taken to that URL in their web browser. Note that the email may look slightly different in other email clients. If you'd like more customization in your lead magnet delivery email, you may consider sending your lead magnet via your email service provider or integration service. To get started, you'd host your lead magnet or opt-in bribe file on your own server or on a file sharing site like Dropbox or Google Drive. Depending on which ESP you are using, your ESP may also host your opt-in file for you (Check with your ESP to find out). Once you've got that file hosted somewhere your subscribers can download it, you can include a link to that file in an email you've created within your ESP. Alternatively, you could link directly to your lead magnet on a custom thank you page after visitors opt in to your page so they would be able to immediately download the lead magnet from your thank you page. To set this up, you'd host your lead magnet or opt-in bribe file on your own server or on a file sharing site like Dropbox or Google Drive. Then, on a custom thank you page you can link a button or text widget to the external URL where you have the file hosted. Can I get a direct URL to a lead magnet in my account? No, lead magnets are only sent via email to new leads via the Leadpages Lead Magnet Delivery System. How do I customize the message for my lead magnet in the Drag & Drop Builder? Click your initials in the top-right corner of your Leadpages account dashboard, then Lead Magnet Delivery. Select the pencil icon next to the lead magnet you wish to change, and edit its fields. Be sure to save your updates for them to take effect. I’m testing my lead magnet and haven’t received it… what can I do? Your lead magnet should send immediately after you opt in to a form where one is configured. If you haven’t received an email, first double-check your spam folder and your form settings to ensure your lead magnet and page are saved. How do I replace the lead magnet file? At this time, in order to replace a lead magnet file, you'll need to create a new lead magnet in your account settings under Lead Magnets. You can certainly copy/paste the text you have from the previous version of your lead magnet email into the new version. Can I use Leadpages to send a lead magnet to a current subscriber? Our Lead Magnet Delivery System is designed for new subscribers only. If you want to send files to your current email list subscribers, you will need to handle that through your email service provider or integration service. If you continue having trouble, reach out to our support team and we can help out!